President Obama smiles as he is greeted by Saudi officials, but not King Salman, at King Khalid International Airport in Riyadh on Wednesday. (by Roberta Rampton, Reuters) – RIYADH, Saudi Arabia — U.S. President Barack Obama arrived in Riyadh on Wednesday to meet Saudi Arabia’s King Salman ahead of a summit with other Gulf Arab leaders on Thursday and with regional tensions with Iran likely to be high on the agenda. Obama comes to the world’s top oil exporter for a fourth and likely last time as president hoping to reassure it and other Gulf allies of Washington’s commitment to their security, and to seek ways to reduce sectarian tensions in the region. However, his meetings come in the shadow of disagreements that have further cooled an already strained atmosphere between the old allies ahead of the talks. 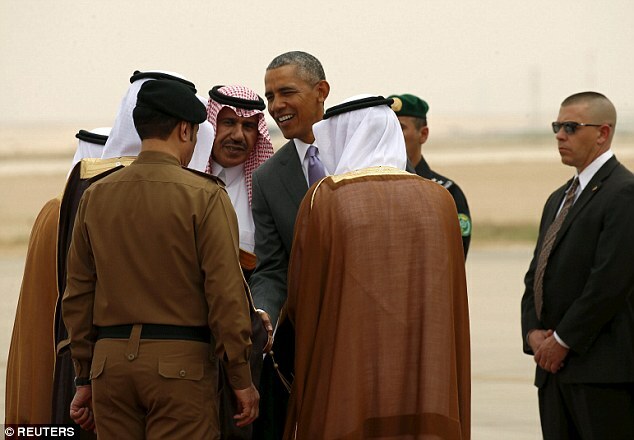 Unlike in previous visits, Obama’s arrival in Riyadh was not aired on live television. 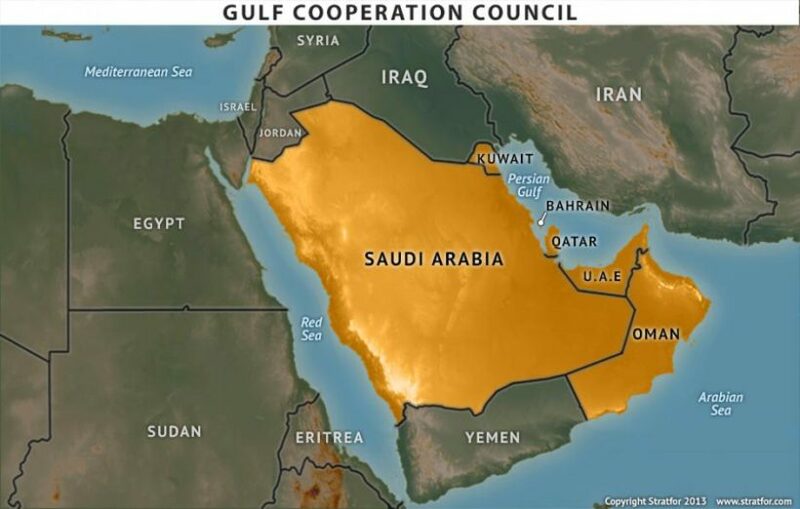 The Gulf Cooperation Council (GCC) groups Saudi Arabia, Kuwait, Qatar, Bahrain, the United Arab Emirates and Oman which are ruled mostly by Sunni Muslim monarchies, with the exception of Oman (where they are Ibadi Muslims). They see Shi’ite Iran as a threat to their security and say its involvement in Iraq, Syria, Lebanon and Yemen has fueled conflict and deepened sectarian divisions. “Hezbollah is shining in the Muslim world. It doesn’t matter if a corrupt, dependent and hollow government with the use of petrodollars condemns it in a statement. To hell with it,” he wrote. The White House shares the view of Gulf Arab states that Tehran plays a destabilizing role, but has said it hopes to bring them and Iran to develop a “cold peace” in which their rivalry does not further inflame smoldering Middle East tensions. Greeting Obama in an ornate room in a Riyadh palace, King Salman said he was pleased the American president was visiting and Obama thanked him for hosting the summit. Before Obama met King Salman, in an ornate room in a Riyadh palace, U.S. Defense Secretary Ash Carter had talks with his Gulf Arab counterparts on ways of countering Iranian influence and fighting the Islamic State group, hours before President Barack Obama arrived in Saudi Arabia. They agreed on joint cooperation toward improving Gulf missile defense, special forces and maritime security, but no new deals were announced. The GCC secretary general said the bloc and the United States would stage joint maritime patrols to stop weapons smuggling to Iran. American officials said these were already taking place and did not represent a new step. However, last year’s nuclear deal between Iran and world powers led by the United States was seen by Gulf Arabs as a sign that Washington was making overtures to Tehran. They fear Obama also wants to reduce U.S. involvement in the region. More recently, Obama was quoted in an American magazine interview describing some Gulf and European states as “free riders” who called for U.S. action without doing enough themselves. In comments that were widely criticized in the Gulf but not directly responded to by top officials, he was also quoted as answering a question about whether Saudi Arabia was America’s friend by saying “it’s complicated”. Saudi television earlier broadcast the arrival at Riyadh airbase of Gulf rulers who were welcomed on the runway by King Salman and a host of other robed officials. 2. a) What is President Obama’s goal for his trip? b) Do you think he will succeed in these negotiations? Explain your answer. 3. a) List the countries that make up the Gulf Cooperation Council (GCC). b) Who leads all of these countries (except Oman)? 4. a) For what reason did U.S. Defense Secretary Ash Carter meet with his Gulf Arab counterparts? b) What was the outcome of this meeting? 5. What concerns do the GCC countries have regarding U.S. relations? a) Tone can be defined as: The writer’s attitude toward his readers and his subject; his mood or moral view. How does the tone of Mr. Peters’ commentary differ from the tone of today’s article? (How does his point of view on U.S.-Saudi relations differ from that of the Reuters reporter?) Explain your answer. b) What responsibility does the Obama administration (as well as whoever becomes the next president) have to address this huge issue with the Saudi government, who are supposed to be our allies?